The Basilica of Saint Mary continually strives to make the church and campus facilities accessible to all parishioners and visitors. If you encounter barriers, or have suggestions, please let us know. West side of the church (N. 17th St). Enter the west ground level doors of the church (handicapped accessible entry) Take the elevator up to the sanctuary. Download/View a map of the Basilica campus. There is a ramp on the east side of the building. The Cowley Center lot on east side of the church, enter on N. 16th St. - only reserved for handicapped parking on weekends. Please display your permit. Violators may be towed. East and west ground level entry doors (under the Hennepin Avenue main stairs) equipped with automatic door openers. Church elevator located near west Hennepin entrance for access to all levels of the church. Church center east bronze door is equipped with automatic door opener. Located on the church’s ground level and lower level. 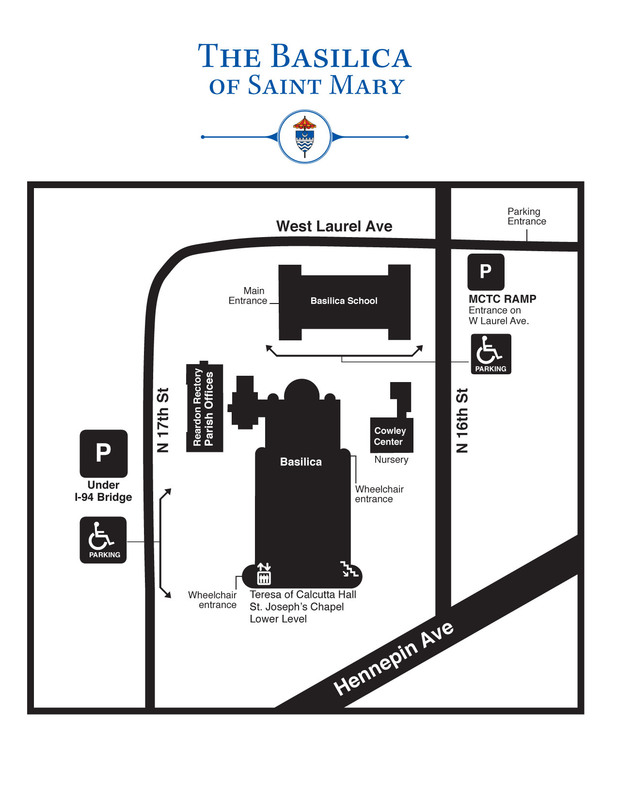 Wheelchairs are available for use in the church located near the Hennepin entrance. Please ask an usher for assistance. The best locations are in front of the first row of pews on the east side of the church or at the break in the pew rows, referred to as the crossing. Enter through the ground level doors and take the elevator to the Lower Level. From the elevator go through the Gallery to the Teresa of Calcutta Hall. Please carefully note locations. Metro Mobility must have exact the exact addresses for pick-up and drop-off. Access at Circle drive on N. 17th St.
Access at Parking lot on east side of the church, enter on N. 16th St.
Sign language interpreter at every 9:30am Sunday liturgy and children’s learning programs. Listening devices available near Hennepin entrance for all liturgies. Large print worship aids for Mass and special liturgies. Tour guide materials in braille. Low-gluten hosts (0.01%) are available by request by speaking with an usher. The recipient will receive the host from the priest. Mother’s Room available to nursing women in the Anne and Joachim Room (Bride’s room) on the church’s ground level. Please request access to this space from an usher or custodian. The room is equipped with a sound system to hear Mass by pressing *202 on the telephone (*302) to turn off. Marked service animals accompanying their owners are welcome in all Basilica spaces. The weekly leaflet is available on the Mass Times page as a pdf download. Eucharistic Ministry available to the homebound for those temporarily or permanently physically unable to join in worship on Sundays. Please call the Parish office to schedule. Emmaus Ministry connects listening ministers with anyone who is coping through a transition and needs to talk. Contact Wendy Caduff for more information. Elevator offers access to all levels. Handicapped Entrance located on west side off of 17th Street. Public meeting rooms are located on ground level are fully accessible. Handicapped Restrooms available on the ground level.